There’s not much to it. 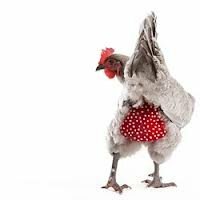 When one hears “Chicken Diapers”, you pretty much know what you’re going to get when you click the link. You’re proving that there is a relatively large market for chicken poop containment devices, for those of you who like to urban farm or raise a pet chicken. Seriously? Do you know anyone who owns a pet chicken that would benefit from this? And how do other chickens feel about fashion? How many cloth diapers does one family need? Celebrate Diaper Free Week by Going Diaper Free! This WEB WATCH entry was posted in shopping, Websites and tagged bathroom, chicken, pets, shopping, website on June 13, 2013 by web gangsta.